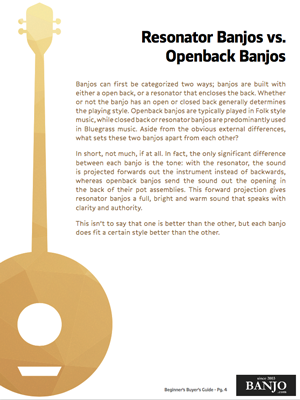 This is a light-weight banjo that is made especially for musicians who want the warmer tones that go well in a string band with a fiddle and bass. The result is a very mellow banjo sound, a lovely full tone. The Old-Tyme Wonder is reliable and exceptional with its all-around “woody” tone, playability, versatility and responsiveness. A classic, now from the craftsmen at Deering! Made in USA. For Clawhammer banjoists who prefer a scooped neck to ease plucking their banjos over the fingerboard we make the Vega Old Tyme Wonder. We build in a traditional “scoop″ that allows more room for the fingers and thumb of the right hand to pluck the strings over the fingerboard. We steam and bend our violin grade maple rim and install a fiberskyn head over the rim, attaching a classic “no knot tailpiece″ for a traditional old time sound. This is a light weight banjo that is made especially for musicians who want the warmer tones that go well in a string band with a fiddle and bass. Includes: Vega Old-Time Wonder 5-string open-back banjo, premium hardshell case, electronic chromatic clip-on tuner, a set of strings, leather strap and beginner clawhammer DVD. A very dark sounding banjo with fiberskyn head and scooped fingerboard. It is not a bright sounding instrument. A very lonesome sounding tone that is perfect for minor tuning.